For those who like it loud, fast, and gritty this stuff never gets old. 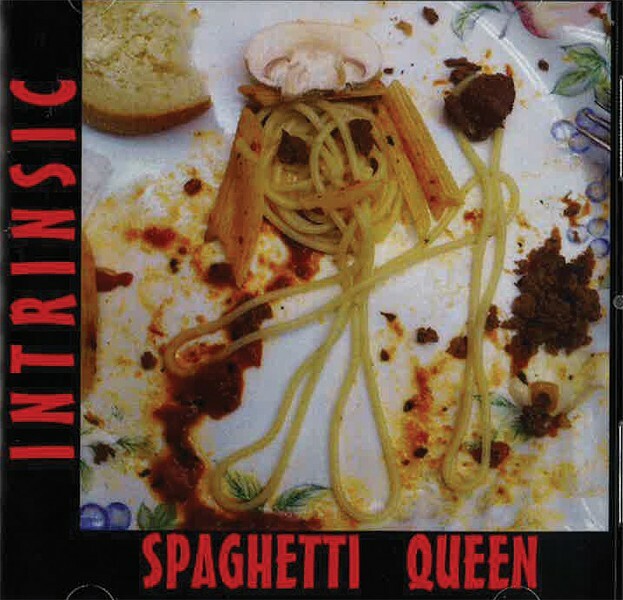 "Spaghetti Queen" is album number four for Rochester rockers Intrinsic. It's a little bit o' grunge a little bit o' punk, along with some Supersucker-style rock 'n' roll defiance. "Spaghetti Queen" is an all-around good 'un. This 13 track rock 'n' roll show stars the guitar and the bass, which is slung like its six-string brother as it apes the guitar lines for added thrust and saturation. It's both sweet and brutal, like Jell-O with rocks in it. Vocally, the songs are held at a discernable — sometimes harmonized — yell, but could stand to be a little hotter in the mix. Everyone digs guitar, but it's also about having the words spit in your face, too. Rhythmically the drums are a full-on four on the floor thunderstorm. The overall speed is intrinsically steady and sturdy. It won't break your neck, but it very well may put you in something orthopedic.